65.0% of respondents would recommend this to a friend. Came earlier than expected! Came earlier than expected! We decided last minute-ish (Friday before the Wednesday 4th of July) to add sparklers to our evening fun line up. We weren't sure if we would get them in time if we ordered on Friday. They were promised by Tuesday, but Superior Celebrations came through- they came to our door on Monday!!! We were thrilled & the kids & adults had a grand time taking pictures of the sparklers at night. Will buy from them again. Good Variety. Long and safe. I should've ordered more! Quick deliver, and easy purchasing. When ordering, I made sure to read comments and notes but unfortunately my pregnant brain overlooked one minor detail that was super important...the Blue sparklers are gold. Even though the box reads "Blue" the details under the product information read "Gold." This was not pleasant to realize after ordering and receiving the product but Superior Celebrations was super nice in their response and very helpful in coming up with a resolution. Other than that, the sparklers work just fine and the other two colors were just as described on the box. These were part of a birthday bash for my 4 yr old great gran daughter. She enjoyed teh July 4th fireworksa so much all she wanted for her birthday on Halloween was "Fireworks". These were much louder and more colorful than those we bought locally this past summer. Will use this source again. Had a great Diwali experience with the sparklers. Kids loved them. The Red and Green sparklers were very smoky and difficult to breath around them. I ended up with a bad cough. The Gold were a lot better. Merchant Response: It is true that color sparklers burn with more smoke than traditional gold sparklers due to the added color, and the effect is more torch-like than sparkly. This is usually not too bothersome during typical outdoor use, but we appreciate the feedback as this is great information for others to consider. The gold ones lit up fine, like real sparklers, the blue and red lit up like smokey flares. 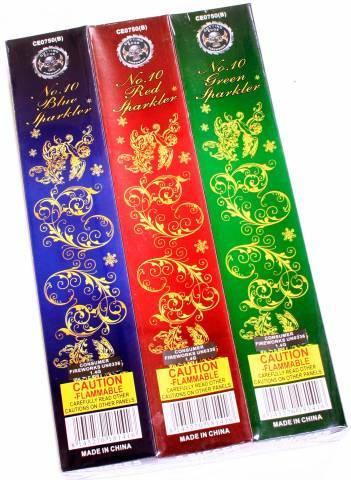 Merchant Response: As noted in the product description, the effect for color sparklers is more torch-like than a traditional gold sparkler because of the added color compounds. This also makes them smokier than a gold sparkler. As such, these are fun for parties, but not the best fit for events like weddings. Merchant Response: We recommend using wind-resistant, torch-style lighters for best results when lighting sparklers. The next best option would be a long-stem barbecue lighter, but those do take a little longer to light. Also, the exact usage in this review is unclear from the information provided, but we want to note that we do not recommend using any of our wire sparklers in cakes. Instead, we recommend our < a href="https://www.superiorcelebrations.com/product/n-bm11452-1/bottle-sparklers-cake-sparklers.html">Bottle/Cake Sparklers< /a>, which are food-safe and designed specifically for that purpose. The color of the sparkler. I used the ones in the blue box for my daughters baby gender reveal party because she is having a boy but when we all lit our sparklers they were RED! Lesson learned - light a test sparkler before the party! Merchant Response: We're very sorry for the confusion. This is the first time we've heard about the sparkler color not matching the box color, but the precise color of a given sparkler isn't critical in most situations, so it's not something a customer would typically report back. These aren't designed specifically for gender reveals, so it would certainly be best to test sparklers first for that purpose. Great! Fun and enjoyment for any occasion! Great! Fun and enjoyment for any occasion! The kids had a great time with these sparkles. Also, the adults enjoyed watching the kids having fun. It was great! One color (I think green) looked like a normal sparkler. The rest were like a big match - a largish flame and no sparks. Disappointing. 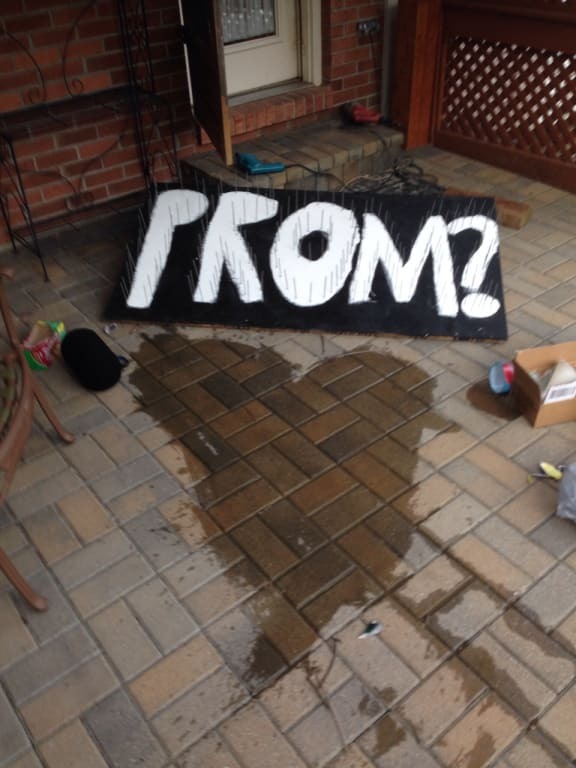 I used these to ask my girlfriend to prom so they were effective for the purpose I used them for. I'm assuming most people buying these won't be conducting pyrotechnics with them and will more than likely be using them for children's amusement. Therefore they will be a huge disappointment. I was rather upset by the duration of the sparkle and the amount of sparkle it gave off. It's more like a color fire stick. They are safe and won't burn you but you will definitely need to keep relighting sparklers constantly to get satisfaction from them. I wouldn't buy them again. This board had about 250 mounted to it. We bought for kids for Diwali Festival.. We bought for kids for Diwali Festival..
We bought for kids for Diwali Festival.. Festival of lights.. they loved it! Delivery was as requested... Perfect! right on time! The sparklers came on time. The person I spoke to confirm the delivery time was very accurate and extremely helpful. I will definitely be buying more in the future and have already shared your website details with friends.